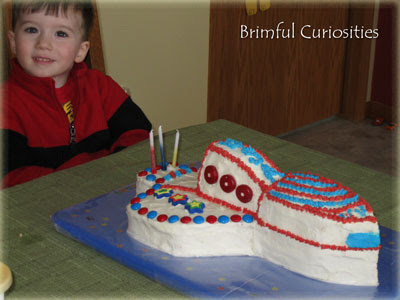 My son requested a space ship cake for his birthday. 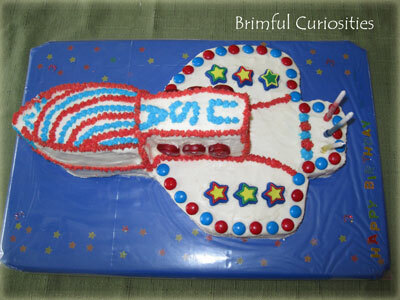 My mom enjoys baking cakes and found an instructional video on the Betty Crocker website for a Space Shuttle Cake. Didn't it turn out cute? It's ready for take off! By the way, the Space shuttle Discovery, NASA's oldest shuttle, is due to return to earth today for the final time this morning [10:57 am CT]! For coverage of the landing, watch NASA TV. Wow, I thought for sure you bought it! Great job! That came out superbly! I love it, and I know he did too! What a lovely cake in just the right colors. I bet it was delicious, too! That is awesome! Your mom is very talented! Super cute. It came out great. That is one cool cake! Way to go, I don't think I could ever make a space shuttle look that good. Super cool! I made one last year. I think yours tops mine! I made a cool robot though. This cake looks gorgeous. Happy birthday to your son! A perfect launch timed with the retiring of Discovery shuttle. Now I would love to have this one on my son's birthday!! I can't believe you made this!! It turned out awesome. Happy birthday to your son!